When will I find out what cabin my child is in? Will we be able to switch cabins at check-in? You and your campers will stay together through the entire check-in procedure and will find out the cabin number and counselor(s) from a staff member in the lodge area (there are station signs posted & staff available to direct you). Check-in times are between 1:00 pm and 2 pm on opening Sundays for each session. You will meet your cabin mates at the cabin; please do not ask at check-in who is in your cabin. 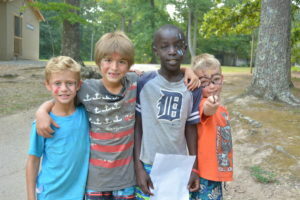 The placement of campers is done by grade and age with camper requests considered. It is a very difficult and delicate process; therefore we will not change camper cabins at check-in except in the case of grade or age error. What about requesting a friend to be in the same cabin as my child? While we encourage campers to meet new people and be open to cabin placement, we understand the first time camper may be apprehensive about being “alone” in a cabin. In addition, campers who do not live in the same city may only have this time to see each other. Therefore, you may request one or two people with which to be placed in the same cabin. If more than two campers are listed, or if the other campers’ parents do not have matching requests, then the request will be discarded. Camp Marymount is not responsible for contacting parents in order to complete requests. Is it OK to bring my Health Form with me? NO. Because the camp Health Care Personnel must sort through and read over 600 Health forms each summer, we ask that you email these (along with the insurance card copy) to info@campmarymount.com a min. of 2 weeks prior to your camp session start date to avoid a later check-in time. What happens on the Girls’ three week session visitor Sunday? If I can’t come then, could I stop by at another time? Visitor Sunday is only offered during the girls three week session on Sunday, June 30, 2019 between the hours of 1:00 PM and 3:00 PM. These are the only times available for parents to visit their campers. We do not offer a visitor day during the two week sessions or the one week session. Because of the number of campers, the busy schedule at camp, and security reasons, it is not feasible for visitors to come at any other time. We will email out a visitation schedule so parents and families know where to meet their camper. We ask that visitors not enter camp until 12:45 PM . The schedule will also be posted on the porch of the lodge. You will find staff available at the lodge area to answer questions or direct you to your camper. You are invited to bring a picnic to enjoy with your camper either outside or in the dining hall and/or participate in the planned programs/activities. Because travel times can be altered and children may confuse the arrival times, we have campers join an activity rather than sit at the cabin or lodge waiting for his or her visitors. Please note that if you say that you “might” visit, the camper will usually expect you to be there. It is best to let the camper know in advance whether or not you will be coming. DO NOT bring your pet to camp. What if I cannot visit on Sunday, what will my child be doing? Can they call home? There is no need to worry about your camper if you are unable to visit. Many children are from other states and even other countries and day travel is not possible. There are activities and events planned for Sundays and the staff will give extra attention to those who will not have visitors. Because of logistics, campers are not allowed to call home. We ask that visiting parents not allow other campers to use their cell phones to call home or any other place/person. Can someone else visit my child? Campers may have visitors other than parents. These visitors should be relatives or close friends of the camper with whom they are comfortable. We do not allow un-supervised children (under 18) to visit camp and will ask them to leave. Campers may only leave with an adult (age 18 or over) other than his or her parent if the parent or guardian has given written permission. Faxed permission is allowed on an emergency basis, but email or phone permission will not be given. Campers may not be released to any non-relative under the age of 18. Visitors may be asked to show ID if they are taking a camper off of camp property. Find the permission form on the online camper account by logging in. When do i pick up my child at the end of the session? The last day of the two week session and three week is on a Friday. Pick up times are between 8:30 and 10:30 am. Please make arrangements to have your camper picked up during these times. If you have questions or need to make special arrangements, please contact the office prior to the closing day. The last day of the Boys’ One Week Session pickup ONLY is between 1:00 PM and 3:00 PM. Above all, Campers are expected to follow the 10 golden rules of Marymount. In addition to our golden rules, campers can expect the following. Meals are eaten family style seated by cabin in the dining hall. Campers are expected to attend all meals and observe appropriate table manners. Campers will help clean the dining hall after a meal on a rotating basis. Campers are also required to participate in daily cabin and camp clean-up times. Campers are expected to attend daily prayer services and Sunday Liturgy as part of the camp program.